Our backyard garden is on the brink of starting to produce massive amounts of fresh zucchini and tomatoes, and I can’t wait! 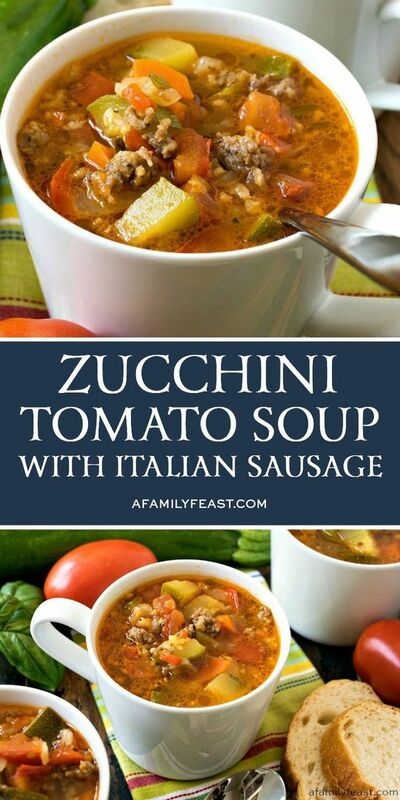 Especially because I know that Jack will be cooking up a batch of this fantastic Zucchini Tomato Italian Sausage Soup! Now, I know that some of you may be thinking that a hot soup is the last thing you’d think about cooking in the middle of the summer – and I totally get that. 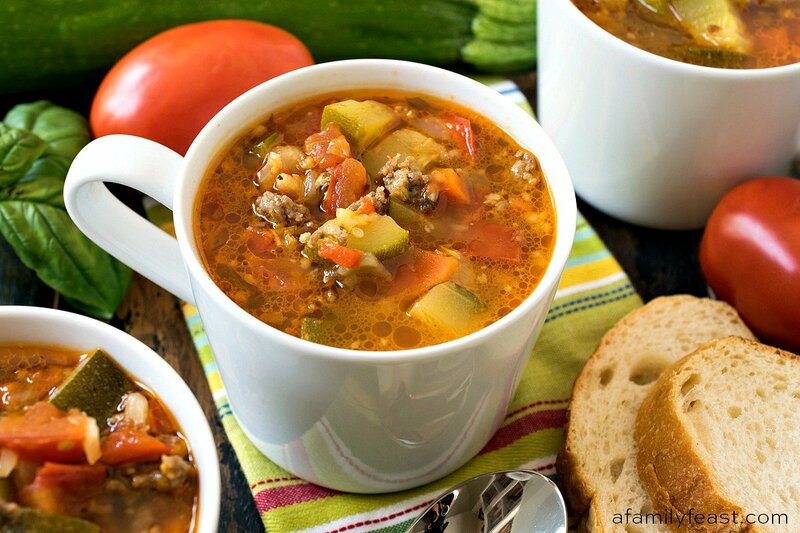 But we make and eat soups all year long – especially when they are as delicious as this Zucchini Tomato Italian Sausage Soup. Once the zucchini is added to the pot, try to avoid overcooking. The squash should be just tender. In a large soup pot or large Dutch oven, place olive oil over medium high heat and once hot, add sausage meat. Break up meat while it cooks. Once the meat has browned, add onion, celery, carrots and bell pepper and sauté for four minutes. Move the vegetables to the sides and lower heat to medium. Add garlic, pepper flakes and tomato paste to center and cook for two minutes, stirring occasionally. Add tomatoes, zucchini, salt, pepper, broth, Parmesan cheese and Parmesan rinds along with fresh basil and fresh oregano and stir to combine. Bring to a medium simmer and cook just long enough until the vegetables are tender, about 10-15 minutes. Remove from heat and remove and discard the Parmesan rinds. Serve immediately with additional Parmesan cheese on the side. 0 Response to "ZUCCHINI TOMATO ITALIAN SAUSAGE SOUP"